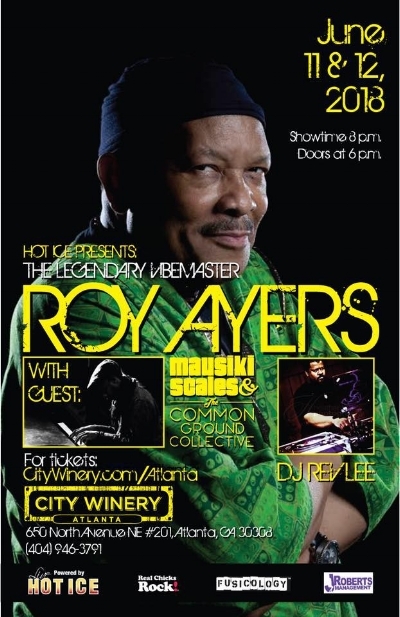 Atlanta’s own Mausiki Scales & The Common Ground will open the show for The King of Vibes, Roy Ayers, who returns to Atlanta for performances June 11th & 12th at City Winery Atlanta. Ayers ranks with James Brown and Bob James as one of the most sampled artists in music, with hits like “Everybody Loves The Sunshine” and “Searchin.” Always a pioneer in jazz fusion music, his collaborations range from [now] Soul Queen Erykah Badu to Nigerian Afrobeat King Fela Kuti to Punk Funk icon Rick James and Hip Hop Jazz crusader Guru on Jazzmattazz. Ayers’ music also blazed the dance floors from his disco charting hit “Running Away” to his work with House music producers Lil Louie Vega and Masters At Work.